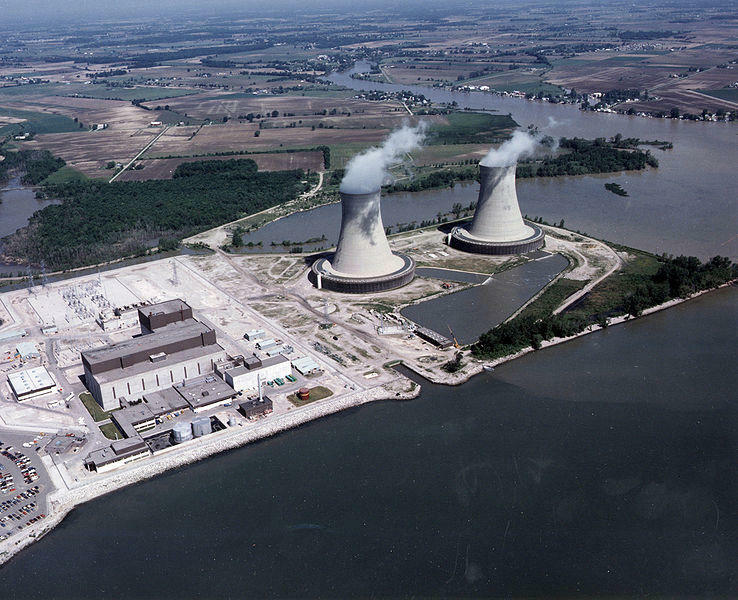 The twin cooling towers at DTE's Fermi-2 nuclear power plant. Employees being trained at a simulator at DTE's Fermi-2 nuclear power plant. The Nuclear Regulatory Commission approved permits for building another nuclear reactor which would be called Fermi 3. Despite the government approval, DTE Energy spokesman Guy Cerullo says nothing is definite. “We have the license and that’s a great option to have for the future. There are several factors that would play into whether or not we build and if and when at what point we would build the plant,” Cerullo explained. Those factors include things such as the price of coal and natural gas, the customer energy demand, the cost of building the plant, and government regulations on carbon emissions. A nuclear plant emits no greenhouse gases. The cost of building a nuclear plant is a huge factor. And the exact price is not clear. “We do not have a cost estimate at this point,” Cerullo said. Based on the price of other recent nuclear power plants in the U.S., it’s been estimated by others that Fermi 3 might cost $10 billion. However, nuclear power plants almost always go over budget. Fermi 2 ended up costing three times the original estimate. Forbes Magazine has made the case that the U.S. nuclear power program was the largest managerial disaster in business history. Part of those cost overruns were caused by shifting regulations after a partial meltdown at the Pennsylvania Three Mile Island nuclear power plant in 1979. Critics say building Fermi 3 would be a huge gamble amounting to billions that DTE ratepayers would have to pay. Jeff Alson is an environmental engineer and a member of the Alliance to Halt Fermi 3. “Regardless of what you think about all the health and safety issues – which concern me, but people have different opinions about those – but the economics of nuclear power have been such a disaster,” Alson said. With the electricity market changing so quickly, shifting from coal to natural gas, the increased use of wind and solar power, and the developing technologies to store energy, DTE should talk to its ratepayers about what kind of energy they want to pay for in the future. “DTE and the other big utilities are kind of that last vestige of the 1950s kind of corporate structure where they know what’s best for everybody and they don’t care what their customers think. I just feel like DTE needs to come clean and talk to the public about this choice,” Alson said. An analyst of energy in the Midwest, Sam Gomberg with Unions of Concerned Scientists agrees there's plenty to be concerned about. DTE's headquarters in downtown Detroit. “There’s a tremendous amount of risk around building a nuclear plant,” Gomberg said in a phone interview. He says that risk goes beyond the chance of a meltdown or not having anywhere to permanently store spent nuclear fuel. “This is a 10-year project minimum that we’re looking at before this thing might come on line. And what is the world going to look like in 10 years? And in 10 years when you’re about to flip the switch on that nuclear reactor, are you going to look around you and say, ‘Eh, I wish I would have done something different,'” Gomberg suggested. Officials at DTE say they’re aware of the risks. Guy Cerullo says Fermi 3 is just a nice option to have. “Right now, we will not be building Fermi 3. Natural gas generation is the best baseload option out there right now and renewables as well as a supplementary mode of generation for customers,” Cerullo said. DTE is constructing its largest solar array near Ann Arbor. Adding up the solar and wind DTE currently generates in Michigan and the wind power it buys from outside sources, renewable energy is 10% of its energy portfolio. To put it in perspective, according to estimates by some experts, it would take more than 100 square miles of solar panels to produce the same energy as a Fermi-3 reactor. That would be like putting solar panels on 90 percent of the detached houses in Michigan.